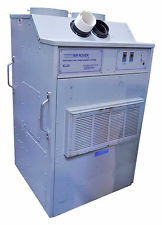 Rental Packaged Air Conditioners are self contained HVAC Cooling Units. They come in cooling capacity sizes from 3 to 30 ton cooling capacities. Typically a ton of cooling can cool about 200 square feet of area depending on current ambient and load conditions. These compact units come in skidded, cart or trailer configurations. These industrial air conditioning units are perfect temporary or urgent rental cooling solutions for special events, temporary emergency cooling, movie studios, movie and retail applications. All commercial ac rentals include 208/230 volt single and 3 phase, plus 460 volt 3 phase configurations to accommodate power at most all location and a friendly installation team. These rental temporary emergency units can be delivered and setup to operate in less than a day. These units come with a reasonable amount of flexible ducting and power cables at no extra cost. Additional accessories include remote power start and stop switch and dual setting adjustable thermostats that can control either supply or return temperature. Also available are power generators for locations that do not have adequate electrical available on site. La Brea Air can arrange everything to provide heating or cooling to any space from 200 square feet to 100,000 square feet and beyond. Rental Portable Air Conditioners are smaller self contained HVAC Cooling Units that provide cold air through adjustable air outlets on the unit. These compact units are rolled right into the conditioned space to provide spot cooling. They come in cooling capacity sizes from 1 to 5 ton cooling capacities and are a perfect solution for temporary rental spot cooling applications. Typically a ton of cooling can cool about 200 square feet of area depending on current ambient and load conditions. These units come with castered wheel configurations and can be easily rolled into place. These temporary AC rentals are perfect for small to large special events, temporary emergency cooling, movie studios, movie and retail applications. Power options include 120 volt and 208/230 volt single and 3 phase options to accommodate power at most all locations. 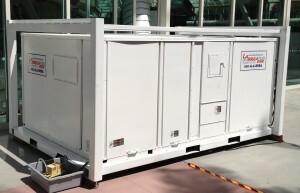 La Brea air provides a 6 foot power cord for the smaller spot coolers and up to 50 feet for the larger ones These rental temporary portable air conditioning emergency units can be delivered and easily setup right in the conditioned space in less than a day. 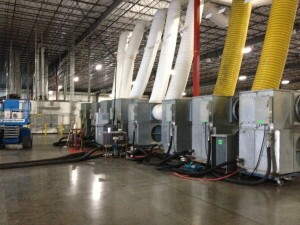 These units come with 25 feet of hot air exhaust flex ducting that would need to be ran outside the conditioned space. Also available are power generators for locations that do not have adequate electrical available on site. La Brea Air can arrange everything to provide heating or cooling to any space from 200 square feet to 1,000 square feet and beyond. Rental Air Handlers consists of a heating coil and a fan on wheels, when connected to hot water with temporary hoses they can provide temporary emergency heating to your facility space. These industrial air handlers can be hooked-up to either one of La Brea’s Rental air cooled chillers or your existing facility chilled water supply and return to provide temporary cooling. For heating air handlers can be hooked-up to hot water generators (boilers) to provide heating. Our experienced “sales-engineers” can assist you in sizing your heating loads and help you select the appropriate rental equipment to meet your needs.